Dr Ankur Gupta is a highly skilled and humble dentist with an exceptional educational background and clinical experience. His dedication to improving patient’s dental health has helped him upgrade his skills and abreast the latest technology to provide the most comfortable dental procedures at affordable prices. Dr Ankur Gupta, started his dentistry service, after graduating from Govt. Dental College, Rohtak in 2001 where he developed a keen interest in Orthodontics. As an advocate of postgraduate study, he pursued specialisation in Orthodontics in the premier institute of Govt. Dental College, Trivandrum and earned a MDS degree in the year 2005. He is eligible for Board of Diplomat of Indian Board of Orthodontics. 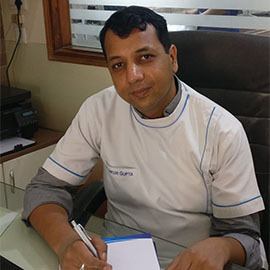 Dr Ankur constantly updates his expertise in multiple orthodontic techniques like Lingual Orthodontics, Implants through various CDE’s programmes. Dr Ankur Gupta has updated his Lingual Orthodontic skills by participating in Lingual Orthodontic Hands On course under the guidance of the famous Dr H M Kyung, South Korea.